We drove for five long days and finally arrived in Arizona. However, the adventure did not end there. Phoenix had always been the ultimate goal. Our decision to go on a road trip sprang from that choice. My wife and younger son wanted no part of the drive and flew to Phoenix instead. There they settled into a rental home we found on Airbnb and waited for me and the older son to arrive by car. We finally got there and still had a bunch of days in Arizona ahead of us. The whole reason behind our destination tied to my wife’s desire to run a specific race. 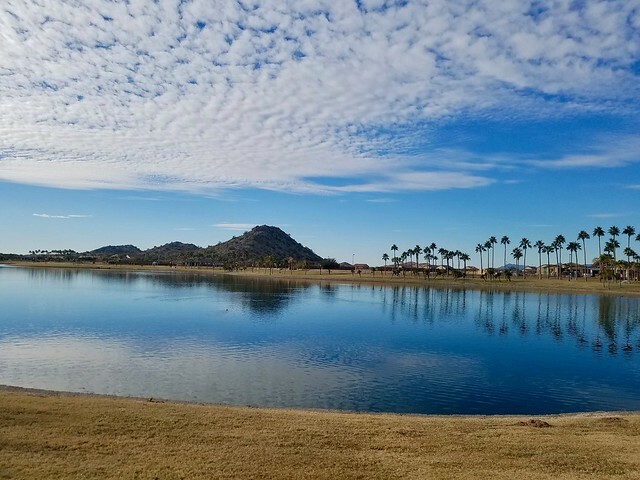 She chose a rental home near the upcoming race in the Phoenix suburb of Goodyear. The housing development clustered on two man-made bodies of water called North and South Lakes (map), rather unimaginatively. It all seemed fine on the mild January days we visited. It even rained a little bit, helping to replenish the lakes. I enjoyed gazing upon them and strolling around them too. Still, I wondered what happened in summer. How much of this precious water in the desert evaporated for such a meaningless decorative purpose? How much longer can something like this last? We also experienced a bit of irony. My wife hurt her foot shortly before we left home and she couldn’t run. We no longer had a reason to go to Phoenix. However, by that point I’d already planned my route and I had no intentions of backing out. I had counties to count. I’d visited six zoos on the long drive with my older son. Now it only seemed fair to spend some time with my younger son. He loves vintage aircraft and enjoys visiting airplane museums. 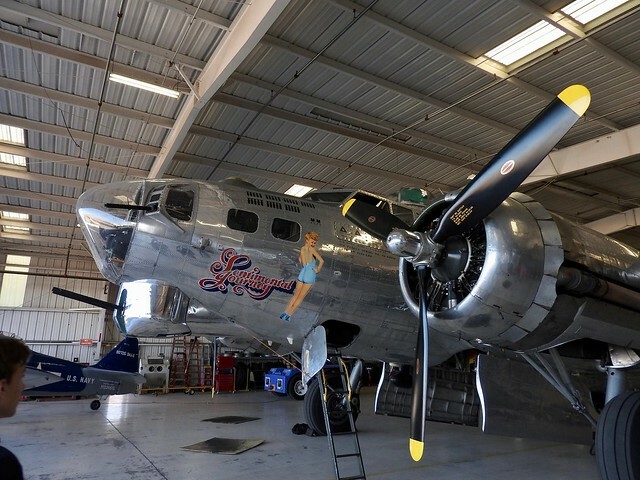 That led us to the Arizona Commemorative Air Force in the nearby city of Mesa. The main facility held a wide range of combat aircraft covering the history flight, with a particular focus on the Second World War. An adjoining hanger included restorations in progress as well as fully-functioning aircraft that could roll onto the runways of Falcon Field Airport (map) and reach the skies. Even better, the museum offered flights on its antique warbirds. They weren’t cheap although I’d just taken one kid across the country. 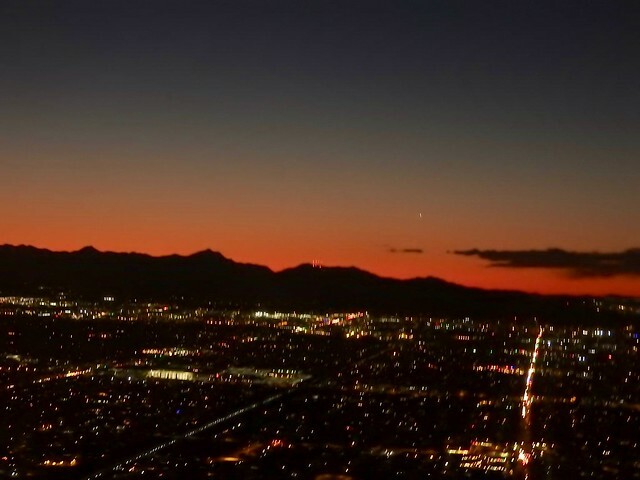 So the other one got a ride in a World War II Douglas C-47 Skytrain as night fell over Phoenix. Plus I could rationalize it as a Christmas present. We got to see the twinkling lights of the Valley of the Sun from a much lower altitude than a commercial jetliner. We were so close we could even see Christmas decorations on people’s lawns. The valley was remarkably flat and the roads aligned in a practically perfect grid. I didn’t have to traipse far from town to experience the rugged terrain of the Sonoran Desert. I simply headed towards Papago Park, right within the heart of Phoenix itself. Imagine 1,500 acres of wilderness completely surrounded by suburban sprawl and that pretty much described the park. 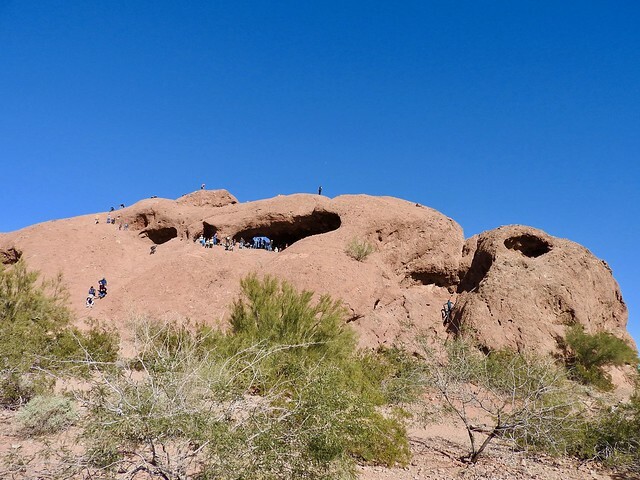 It included a major zoo, a botanical garden filled with desert plants, miles of hiking trails, and fascinating geological features. Hole-in-the-Rock (map) dominated the landscape, rising a couple of hundred feet above surrounding flatness. The natural sandstone formation eroded naturally over a few million years. Wind and water worked in concert to carve chambers in its surface, including one that cut entirely through the outcrop from one side to the other. A sign at the trailhead explained that the ancient Hohokam culture considered this a sacred sight and tracked the position of the sun shining through the hole to mark planting seasons. Hole-in-the-Rock served as something of a geological Stonehenge for these people. An easy trail led to the window on the backside of the outcrop. Most people stopped there and ventured no further. The views of Phoenix were pretty amazing from that point. However, feeling adventurous and probably acting younger than I should have, I had to continue up towards the summit. I got there just fine. Climbing back down was more challenging and a bit scarier. Even so I managed and — since I’m able to write this — obviously I didn’t fall or injure myself. Phoenix offered a nice counterpoint to our many days on the road. Certainly the wildlife we experienced differed from what we’d typically seen before. Australia and New Zealand, so far removed from the rest of the world for so long, featured all sorts of famously unique creatures. I don’t need to elaborate. We’re all familiar with them. I simply enjoyed the opportunity to experience them in their home territories. Animals being animals of course didn’t always cooperate with my plans. I think they enjoyed mocking me. The variety of unfamiliar birds grabbed my immediate attention. We also saw a lot of the usual European transplants like house sparrows and common starlings which we ignored. I’ve never been much of a birder although my older son seemed to be leaning in that direction. He kept pointing at specimens and asked me to take photos. I ended up with a bunch of bird images in my collection as a result. I think I identified most of them correctly although feel free to correct me if you know differently. 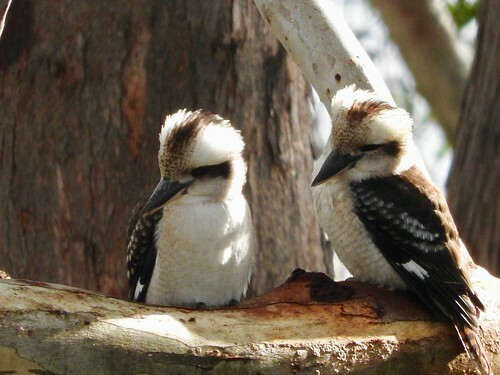 The featured photo showed two Kookaburras. I’m actually proud of that one because I took it from the balcony of an apartment we rented in Nelson Bay, Australia. The Kookaburras perched pretty far away from me and I actually managed to get the photo without it being a blurry mess for once. I’m sure it was a coincidence. Many of the birds we saw in their native habitat would be pets kept in cages back home in the United States. Here they were everywhere. Some like the cockatoos traveled in fairly large packs. They would land in a park and pretty much take over, just like pigeons. I’d rather see a cockatoo than a pigeon. We stayed in fairly populous areas of New South Wales during the Australian portion of our trip and we didn’t see a lot of kangaroos. In fact, I had to use a photo I took in a zoo in Sydney to illustrate this entry. 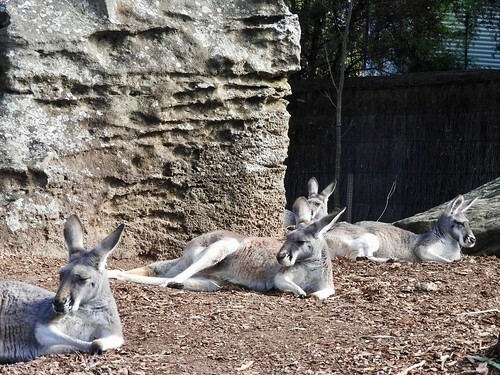 I saw lots more kangaroos on my previous trip a couple of decades ago when we visited the Blue Mountains. Here along the coast, not so much. I’m sure they were there, probably in abundance, so we must have been unlucky. I likened it to seeing deer in the United States — ever-present but popping out on their own schedule. The kangaroos appeared whenever we least expected them as we drove along. At least our kids got to say they saw at least some wild kangaroos so we could strike that particular item from the list. I noted earlier that we used Nelson Bay Harbour as a starting point for a whale watching excursion. Humpback whales spend their summer off the coast of Antarctica and begin to migrate in late autumn, a journey stretching thousands of kilometres towards their South Pacific breeding grounds. 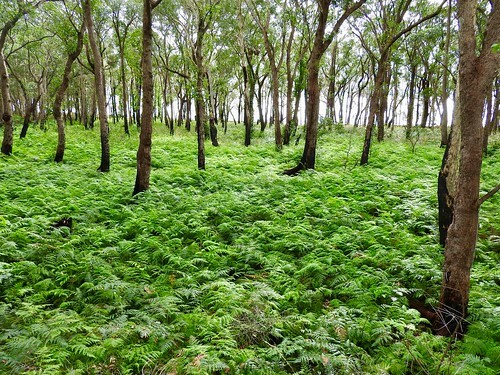 By early winter they pass along the eastern edge of Australia in great numbers. A quirk of geography placed the mouth of Port Stephens next to open ocean within the path of these mighty creatures (map). Ships departing from Nelson Bay could slip into the migration route with minimal effort. Weather conditions seemed favorable the day we headed out. The open ocean had minimal chop. Cloudy skies diminished glare. 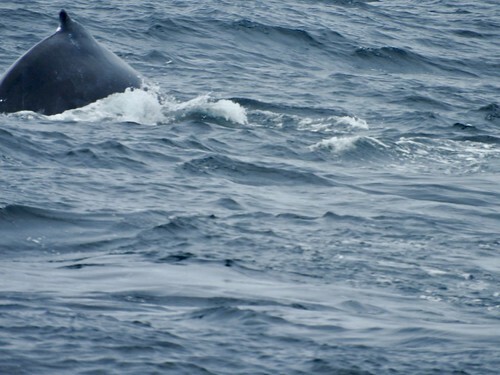 The ship’s crew said that whales could be spotted easier on a cloudy day. I wondered if that might be one of those baloney sayings like it being a sign of good luck if it rains on a wedding day so nobody feels bad. Maybe the clouds worked because we found whales almost immediately once we left Port Stephens and hit the ocean. We continued to see multiple pods back-to-back for the next two hours. I didn’t get any decent photos — whales always seemed to breach while I focused elsewhere — although that highlighted my inability to move quickly enough more than a lack of subject matter. We definitely got our money’s worth. The cruise also came with some bonus creatures. We got close-up views of two more marine mammals; common dolphins and bottlenose dolphins. The common dolphins actually followed our ship for awhile, catching rides in its wake. Then we sailed around a small rocky island where seals basked high above the waves. Sure, we saw some great animals. However our encounters seemed to be defined as much by iconic creatures we didn’t get to see in the wild. For instance, we tried like crazy to find a koala. I got lucky during my previous trip, spotting one in Noosa National Park in Queensland. This time, not so much. We traveled to the Tilligerry Habitat in Tanilba Bay (map) where koalas roamed freely in groves along the Karuah River estuary. Workers there posted information about the latest koala sightings although none had been spotted on the day we visited. We looked anyway, starting where they’d been seen the day before, although they’d long since moved along elsewhere. At least we got a nice walk. The platypus range covers a crescent of eastern Australia and we drove through places supposedly well-populated with them. I knew they must have been there because we stopped at a rest area along the motorway where signs warned people to not use yabby traps (street view). They can harm platypuses. Apparently these devices sometimes drown air-breathing animals. What is a yabby trap? Glad you asked. A yabby is a type of freshwater crayfish (scientific name – Cherax destructor) and people use those traps to harvest them. I had to look that up. We didn’t see any kiwis in New Zealand either. Kiwis are nocturnal. They don’t appear in daylight orginarily. It seemed strange to me that New Zealand pick a bird that hardly anyone ever sees as a national symbol. Nonetheless, that was the case with the kiwi. We did see all three of these animals in captivity though, if that counts. I dropped a hint in one of the earlier articles that our plans went awry only once. That happened in Australia. Upon landing in Sydney, we headed immediately about three hours north by automobile along the coast into the Hunter Region. The Hunter Valley formed the most well-known portion of the region, acclaimed for its numerous vineyards. Originally we planned to spend a little time touring the countryside on a wine tasting excursion. We simply ran out of energy. We’d pushed hard for more than a week by that point and decided to stay put instead. However, the Hunter Region extended beyond the vineyards along the Hunter River all the way to the coast. There we did spend three relaxing days. So while it will sound a little strange to talk about an area without touching on its most recognizable feature, I will attempt to do just that anyway. I’ll get to the vineyards next time. It took me a little while to decipher Port Stephens. Eventually I figured it out. It could mean a local government area that encompassed a number of towns and villages just to the north of Newcastle, New South Wales (map). However, it could also mean the large tidal estuary of the Karuah River that formed a large natural harbour (map). The local government area got its name from the adjacent body of water. I would see the name used in a variety of contexts. I would be like, wait a minute, is this Bobs Farm or is this Port Stephens, because it’s not on the water? 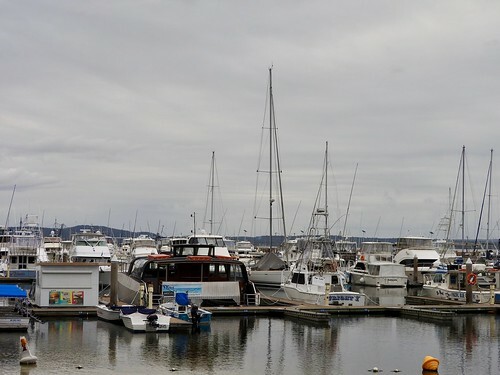 Well, Bobs Farm fell within the geographic boundaries of the Port Stephens Council even if disconnected from the actual waters of Port Stephens. We spent much of our time in the Hunter Region staying at a large apartment we rented in Nelson Bay (map). Nelson Bay, just to be clear, fell within the boundaries of the Port Stephens Council and bordered Port Stephens, the tidal estuary. We visited at mid-week during Winter so it seemed like a quiet place without much activity. I imagined that it must be considerably different during a summer weekend. Its geographic proximity to Sydney practically guaranteed that. I wondered if Nelson Bay got its named from Admiral Nelson, like a number of other places in the English-speaking world. Well, maybe. No one is sure whether the town was named after Admiral Nelson or a vessel named Lady Nelson. The name may have come from the Lady Nelson which was used by Governor Lachlan Macquarie when he visited Port Stephens in 1812 or it may simply have been named after Admiral Horatio Nelson, the hero who died at the Battle of Trafalgar in 1805. I found a bunch of information on the HMS Lady Nelson including the place where she was built, her 1799 christening, the voyages she took, and so on. Unfortunately I never could find out the identity of the Lady Nelson for whom she was named. That seemed odd. Who was Lady Nelson? Maybe it could have been Admiral Nelson’s wife for all I knew, or maybe not. 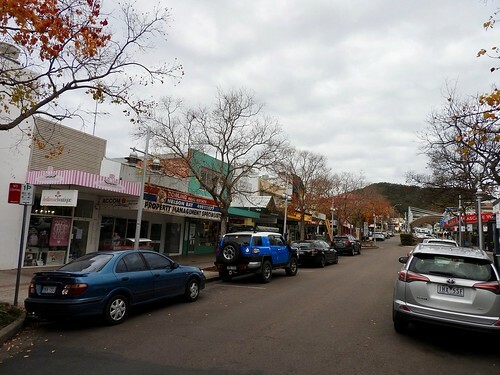 Nelson Bay, the town, also had a harbour. It formed a part of Port Stephens too, the body of water although I guess it also formed part of the local government area come to think of it. I’ve flogged that dead horse enough. A lot of local whale watching cruises used Nelson Bay Harbour as their starting point during the winter migration season. 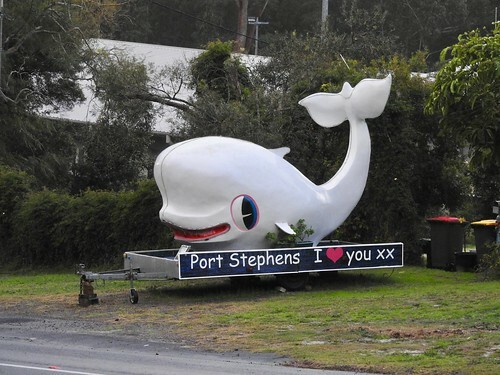 Maybe that explained the photo of the smiling white whale on the trailer. I’ll talk about whale watching at length in a future installment. Leaving Port Stephens and heading back toward Sydney, we stopped outside of Newcastle at Fighterworld (map). 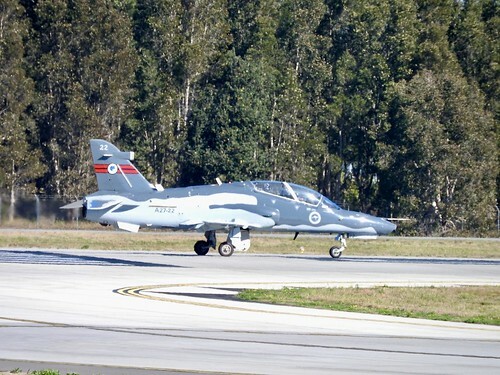 It sat sandwiched within a triangular wedge between the southeastern end of Newcastle Airport and the southern corner of Royal Australian Air Force Base – Williamtown. They shared a runway. We enjoyed watching military aircraft take off and land. My younger son loves military aircraft so Fighterworld became a mandatory stop. He’d visited any number of military aviation museums near air force bases in the United States so this collection offered some interesting new options. He absolutely had to see the De Havilland Vampire and the Hawker Hunter. I’m not exactly sure why. He simply fixated on them when he saw the website. I guess they caught his attention because they don’t normally appear in US military collections, being of British design. The museum included an attached restaurant called Cafe Fighterworld. I didn’t expect it would be all that busy although it attracted quite a lunchtime crowd. Everyone wore an Australian air force uniform except for us. Apparently it was quite popular with the folks next door at RAAF Williamtown. I recommend the milk shakes.